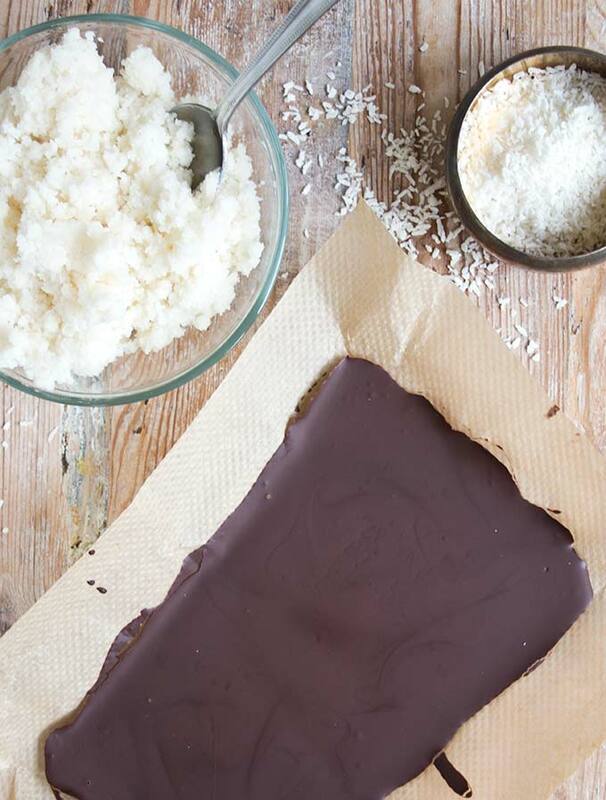 Dark chocolate with a soft and creamy coconut filling: You only need 5 ingredients for this sugar free, low carb Bounty Bar Chocolate Bark. Let’s talk chocolate bars. Which one pushes your buttons? When I was a kid, I used to love Bounty Bars. Not only because I liked the taste of coconut (and I still do), but also because of the wrapper which I thought was just wonderfully exotic. 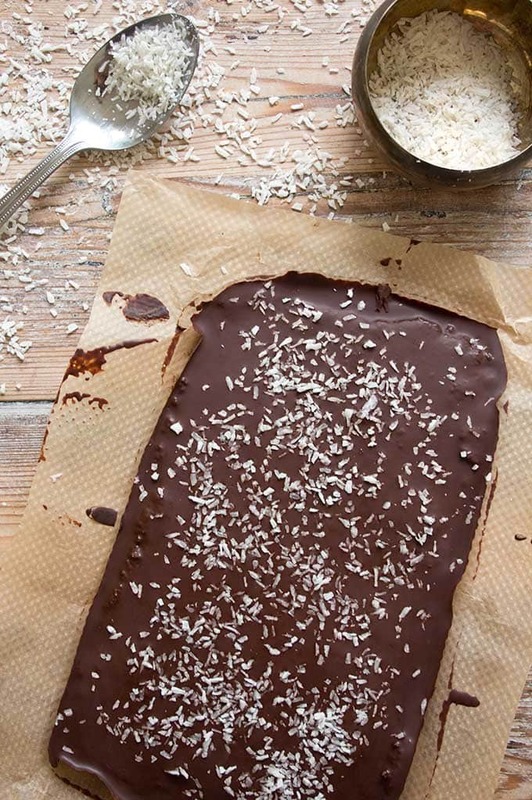 Bounty Bars made me think of summer, sunshine, tropical islands and dancing Hula on the beach. If you consider that the furthest away from Germany I had made it back then was Denmark, you’re basically talking paradise. I haven’t had a Bounty Bar in yonks. But when I waited in the supermarket checkout queue the other day, there they were, in all their Pacific-blue glory. And even though I know they would probably taste like sweetened soap, I still kind of fancied one, for the sake of old sweet memories. Alas, then I had a much better idea. I’d just make my own sugar free Bounty Bars. And then I had an idea I liked even more. I’d make the lazy cheat’s version of Bounty Bars. 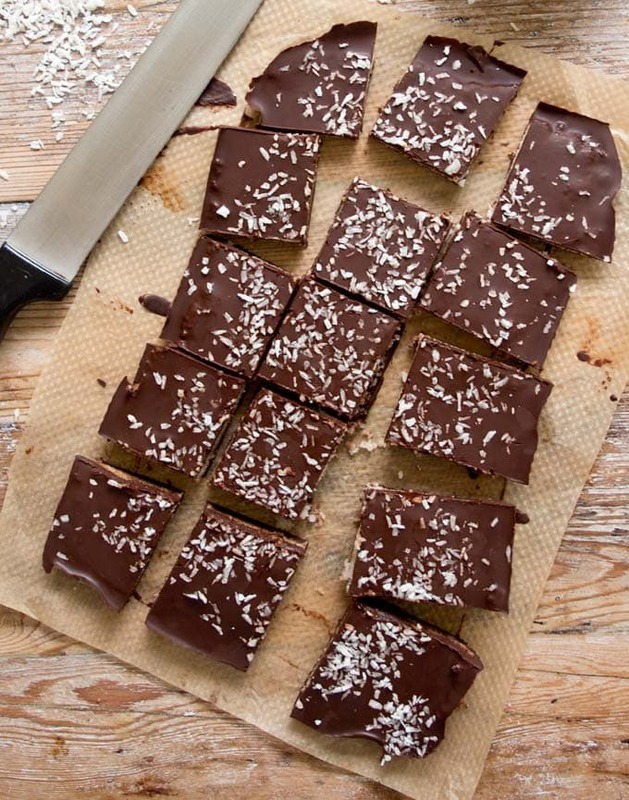 The one that does not involve laborious dipping of coconut shapes into melted chocolate. Hello, Bounty Bar Chocolate Bark! Bounty Bar Chocolate Bark is not only just THE most delicious sweet treat ever, it’s also SO EASY to make. 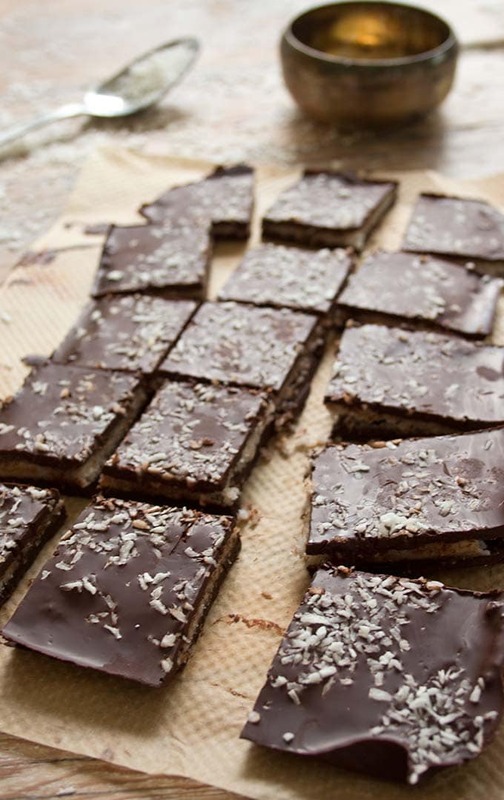 All you need are 5 ingredients, a lil’ bit of patience (while your bark cools and firms up in the fridge) and a TEENY TINY bit of willpower to not scoff all of it in one sitting. So. Let’s get down to the nitty-gritty and talk recipe. 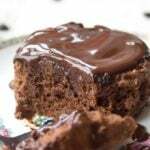 I used 100% unsweetened chocolate, which I sweetened with liquid stevia. OMG what a taste EXPLOSION! My current favourite is caramel-flavoured stevia, because I think it tastes great, but regular stevia would do the trick, too. 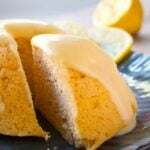 You could also use powdered erythritol to sweeten. Granulated sweetener is not a good idea because it would too heavy and sink to the bottom of your chocolate layer. If you’re after a milk chocolate taste, you could source a ready-made sugar free chocolate bar – there are varieties sweetened with stevia or erythritol. 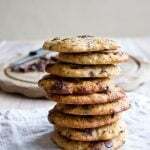 Or you could even make your own sugar free chocolate like I did when I created these Sugar Free Chocolate Chips. 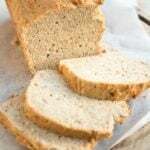 Tastes amazing and is fantastically healthy. Make sure you buy unsweetened coconut and not the sweetened version. This is what I did accidentally – a super-sized packet, no less – and almost choked on when I tasted my mix. Guys, 1/3 was icing sugar. It literally made my teeth curl. Hard to say if I’d have found this yum before I went sugar free. Coconut has quite a bit of natural sweetness, so you don’t actually need oodles of sweetener. COCONUT CREAM AND COCONUT OIL. One long word: Medium-Chain Triglycerides!! These superstar fatty acids have antibacterial and antiviral properties, support your immune system and are heart-healthy. Coconut cream and coconut oil help make the filling taste just as creamy, rich and irresistible as the filling of the original Bounty Bar – only better :). I used the firm part of a can of coconut milk. The leftovers and the liquid part went into a red curry with cauliflower rice later that day. Just a little bit of patience…. until the chocolate has fully firmed up in the fridge. Catch up on news, tidy up your eyebrows, have a nap… do ANYTHING to not touch your bark before it’s hardened properly, especially if you plan to break it into generous Ottolenghi-like pieces as opposed to cutting it. I have to admit, it’s difficult, and my bark sported a couple of telltale fingerprints after I wielded my knife. Can you tell in the photo below? Note: I cut my Bounty Bar Chocolate Bark into 15 pieces, which actually were rather generous in size. 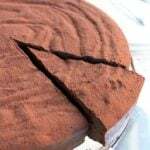 You could easily cut it into 20 pieces and still feel satisfied, especially if you are using 100% unsweetened chocolate which has a very intense taste. Melt half of the chocolate. I did this in a pot over a low heat, but you can use a microwave, too. If you're using unsweetened sugar free chocolate, sweeten with liquid stevia to your liking (ca 12 drops per 100g). Line a small casserole dish (mine was 10x7 inch) with baking paper. Pour in the chocolate and spread evenly. 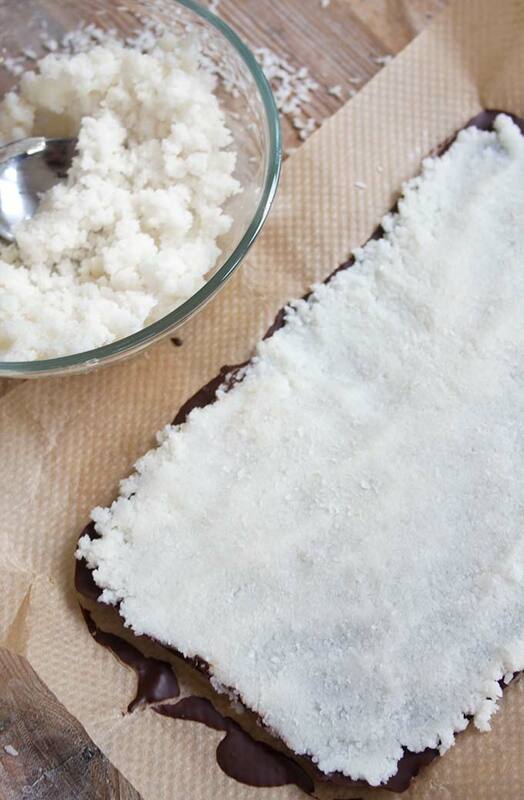 For the filling, mix the desiccated coconut with the coconut cream, coconut oil and sweetener. 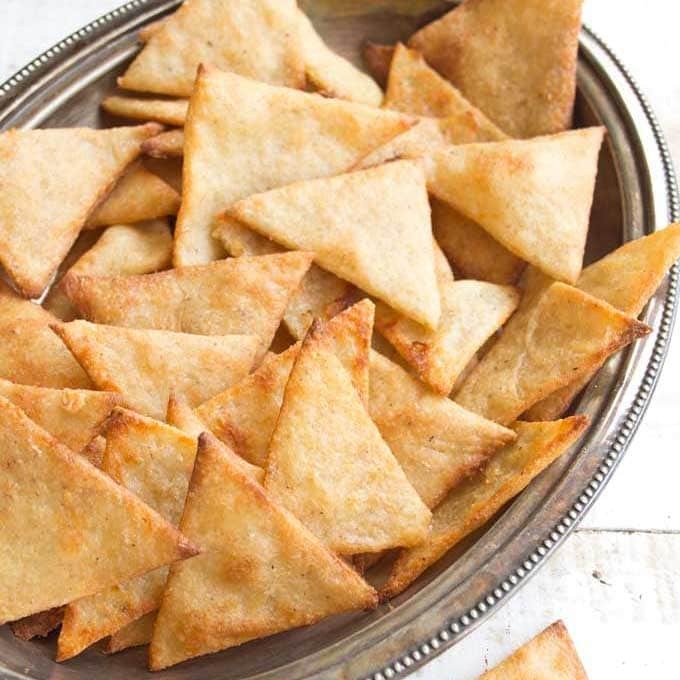 This is best done in a food processor, but you could do it with a stick blender, too. You can buy canned coconut cream - or use full fat coconut milk and only use the creamy part, not the liquid part. Spread the filling over the hardened chocolate base and press down. I ended up using only around half of the filling. I think next time I'll use more to make my bark less chocolatey and more coco-nutty. Melt the second half of chocolate and pour over the top. Sprinkle some coconut on the top. Refrigerate until set, then cut into 15-20 pieces. I had around half of the coconut filling left over, but decided not to change the recipe because it would be tricky to blend only a tiny amount in a food processor. You could make little bliss balls and roll them in cocoa powder, for example. 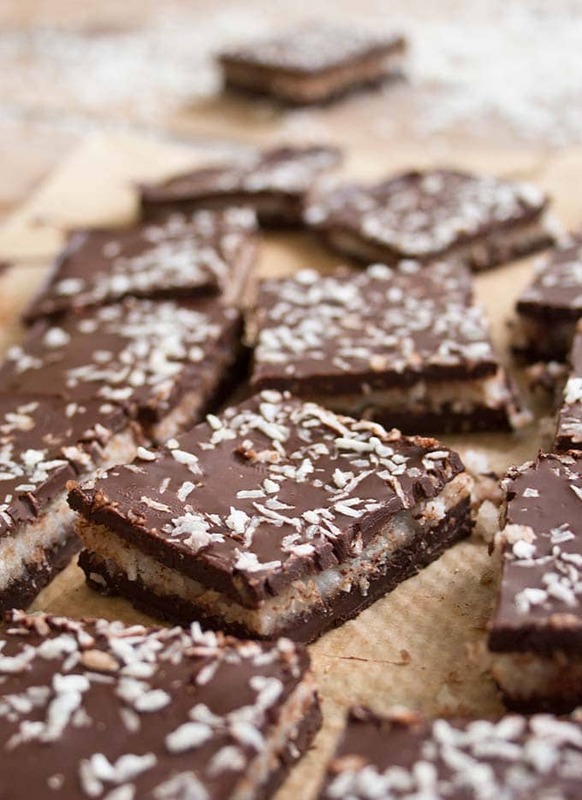 Or use more than half the filling and make your bark more coconutty - I think this is what I'll do next time. I calculated the nutrition facts with half the coconut filling. I used 100% unsweetened chocolate - I discovered a brand called Montezuma at my local Sainsbury's. Sweeten it to your liking with liquid stevia - I used this caramel-flavoured one. 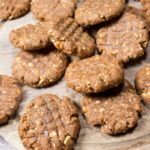 You could also use ready-made sugar free chocolate. In the US, Lily's is a good option. This post contains Amazon Affiliate links. Thank you for supporting Sugar Free Londoner. Thanks for all these wonderful European candy recipes, Katrin! One candy I would love to be able to replicate is Toblerone. I first tried it when living in Berlin 30 years ago, but would love to find a keto version. I searched your website but no results. 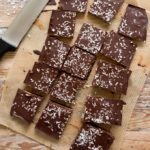 Would you be interested in trying to make keto Toblerone? The shape would probably not be possible, but poured into moulds… Yum! THat’s a great idea! I’ve put it on my list of dishes to experiment with! Hi Veronica, I’m sorry if my description was confusing. The erythritol is for the coconut mixture. For the chocolate, you have different choices. Either you get yourself a chocolate with 85% or 90% cocoa solids. 90% chocolate (I like the Lindt brand) has a very low sugar content, only 0.7g per square. Or you use a sugar free chocolate such as Lily’s, which is available in the US on Amazon. 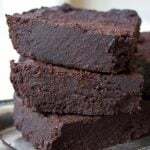 If you want to use a 100% chocolate, you can either make it yourself (check out my low carb chocolate recipe) using powdered erythritol or stevia, or use a 100% unsweetened chocolate such as Montezuma’s, melt is very slowly and add your sweetener. 12 drops of stevia per 100g of chocolate works fine. I get my stevia drops on Amazon, you can choose all kinds of flavours. I hope this helps! 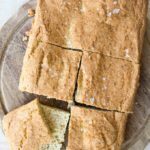 I recently found your website and I absolutely love your recipes!! I’ve already made quite a few of them and they’ve all been delicious. Thank you. I would like to make these bounty’s. Do you think that 1-2 tablespoons of maple syrup would work instead of a granulated sweetener? Hi Jane, great to have you here. 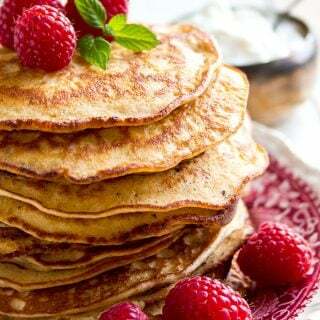 I think using maple syrup would work fine in this recipe. Hope you’ll enjoy it! Could you use dairy cream instead of coconut cream? I think that should work too! Use double/heavy cream so you have the same consistency as coconut cream. I was just wondering if coconut milk, and coconut cream can be frozen, since you only need to use a small amount for the recipe. Thanks ! My filling didnt stick to the bottom layer of the hard chocolate. Any idea why? It tasted delicious though. As long as it tasted good, I wouldn’t worry about it. If you want to make sure it all stays in the right pace, you could try making bounty bars next time and just encase the filling in chocolate. That way it cannot escape! If the chocolate is set to hard nothing will stick to it. Try adding the coconut layer the the chocolate while still slightly soft. Great recipe! Just made this, but I actually made them look like Bounty bars… I could not resist. Great! Thanks for your comment 🙂 Sounds like a perfect Sunday afternoon treat to me! These are incredible! They taste just like Bounty. I used about 3/4 of the coconut filling and made the bark thicker, just like you recommended. Delicious. Hi Lucille, so glad you like the recipe! OMG I used to be the biggest Bounty fan ever. I love anything coconut. 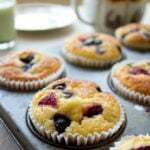 So trying this recipe – great idea! Hello Janet, let me know how you get on!